← My Favorite Pictures of George Harrison! 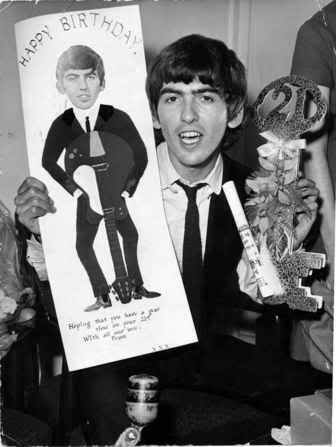 In case you were wondering, February 24th is George’s actual birthday, although he and most of the world thought it was February 25th for most of his life. However, he eventually found out that he was born at 11:50 PM on the 24th. Only George Harrison could have a birthday that spans 2 days! So, today is the birthday of George Harrison: the Quiet Beatle, the Dark Horse, and my favorite Beatle! I’m celebrating today by wearing my All Things Must Pass shirt, and the only way that I see fit to commemorate what would have been George’s 70th birthday is to make a list of all the reasons why I love him. You’ll see that it’s a VERY long list! – Let’s just get this out of the way… He is the single most beautiful person who has ever lived, inside and out! No one else even comes close. If there were a “best looking male celebrity of all time” contest, he should win, hands down! And after viewing my post from yesterday with multiple Georgeous pictures, how can you disagree? – He was an outstandingly skilled guitar player with such a unique touch that I only need to hear 1 or 2 notes of his slide guitar to know it’s him. – He seems like he was a wonderful father to Dhani, and it shows, because Dhani is so much like George! – He had the thickest and most natural Liverpudlian scouser accent of the four Beatles. Thank you veddy much. – He was hilarious and witty and so naturally funny! This led to some fantastic music videos, like Crackerbox Palace and This Song in 1976, which was definitely one of his best years, music and looks-wise. – He was a huge fan of Monty Python and saved the franchise by funding Life of Brian, which I watched for the first time last night… I couldn’t stop laughing! It’s just as good as Holy Grail! And George appeared in it for about 10 seconds! – He wasn’t really “the Quiet one,” as his sister can attest. – He frequently changed his hairstyles throughout the years. Variety and George Harrison are the spices of life! – He initiated the whole relief rock concert thing with the Concert for Bangladesh. Without him, there would be no Concert for Sandy, or Concert for George! – He was the only Beatle, in my opinion, to truly benefit from the breakup and improve musically because of it. All Things Must Pass = Best solo Beatle album BY FAR! – He loved gardening, race cars, and Monopoly, among other things. – He, at one point, looked like Jesus. – He was not afraid to write songs about the Lord or experiment with the sitar and Indian music. In that respect, he was truly an innovator. – He skiied like a boss and saved the day in Help!, while rocking a top hat better than Abe Lincoln himself. – His singing on the 1965 Christmas record… There are no words. The weirdy high, warbly voice in the beginning and at 5:28… Yeah, that’s George doing funny voices!!! – He kept his cool in the face of all the Beatlemania madness, never letting fame go to his head. – He wrote great songs with the Beatles BEFORE Something and Here Comes The Sun. While My Guitar Gently Weeps and Taxman, anyone? Or, even earlier, Don’t Bother Me and I Need You? Exactly. – He rocked those striped pants on the Smothers Brothers show in 1968 like no one else could. Not to mention that fabulous ruffled shirt. Oh my George. – He could dance rather well, on stage and off. Check out A Hard Day’s Night and the video below for proof. The George Harrison Shuffle should be patented! – He basically founded the Traveling Wilburys, and because of them, well it’s aaaallll right, we’re going to the end of the line! – He attended Eric Clapton and Pattie Boyd’s wedding. Why, I don’t know. I guess he had a lot of room to forgive in his heart. – He was great friends with Eric Idle and knew Paul McCartney for almost 50 years. – He had an extraordinary sense of style. George and Pattie are my fashion inspirations. I need an orange sweater like the one he wore in the Revolution video! – He seems like he was a genuinely sweet, loving, and caring person to know. I’ve never read one bad thing about him from someone who knew him well. – He started the Material World Foundation, which is still going strong! – He has transcended generations. Millions of people today, including me, still love him for being so special, unique, spiritual, and lovely. – He manages to simultaneously make me sad and cheer me up. Just hearing a certain song of his, or even a note of his guitar playing, can make my eyes gently weep. At the same time, he’s the person who makes me smile more than anyone else. An appropriate emotional response to such a complicated man, I think. – He had the most luxuriously wavy Beatle hair for sure! I wonder what shampoo he used… I’d love to make my hair that sleek and shiny! – He realized that there was more to life than material things at a young age, and spent most of his life searching for the truth. – According to Beatleology, he is my inner Beatle, the one I’m most like! I knew there was a reason I like him so much! We’re a lot alike! – He gave Tom Petty multiple ukuleles at once for no reason whatsoever other than to be nice. Hey, you never know when they might come in handy! – He had such a unique, gentle, soothing speaking and singing voice that always puts me at ease. – He released great music consistently up until his death in 2001, and even his posthumously released album Brainwashed is so good that I can only imagine what else he had up his sleeve. There are more, but I don’t want this to drag on forever. Besides, I think you get the picture. George is amazing and wonderful and I love him. If I could have one wish, it would be for him to be alive. And if I ever met him, the first thing I’d say would be, “I LOVE YOU!!! You’re such an inspiration! Thanks for the beautiful music!” So, one more happy birthday to my sweet George!!! You rock Georgie!!! Hare Krishna to all!! !